Burgers are everyone's favourite.But store bought burgers are missing something.Yes Indian spices are missing there.So I planned to prepare it at home,with indian spices.Its a easy process and prepared within half an hour, excluding marination time. 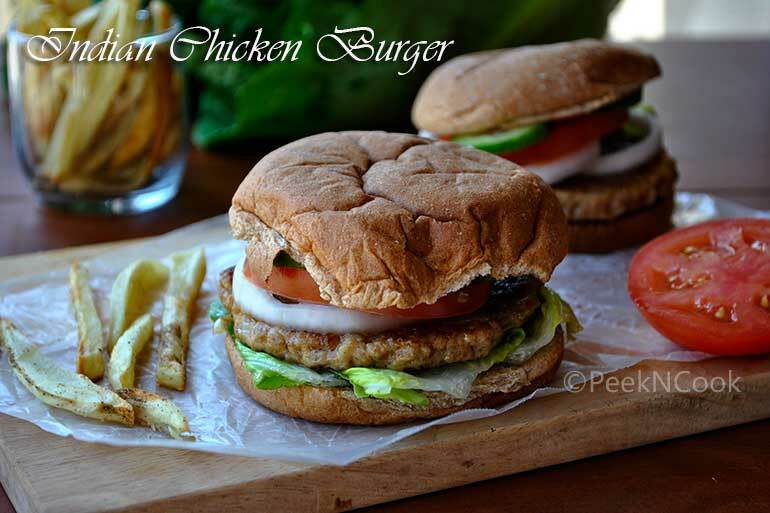 Its a chicken burger, prepared at home with indian spices.Its a easy process and prepared within half an hour, excluding marination time. Take a bowl and add ground chicken, onion, garlic, chili, tandoori masala, garam masala, cilantro, egg, black pepper powder & salt and mix well. Devide the mixture into 4 equal parts, shape each portion into a thick round patty, shalow fry the patties on hot griddle till the patties are golden brown. keep them aside. Take burger buns and spread butter on them and toast that butter spread side till light brown . Place 1 lettuce on 1 bun, then place a patty, onion rings, tomato, mayonnaise Or in your way you can decorate the burger and on the top place another bun . Continue this process to make the remaining burgers.